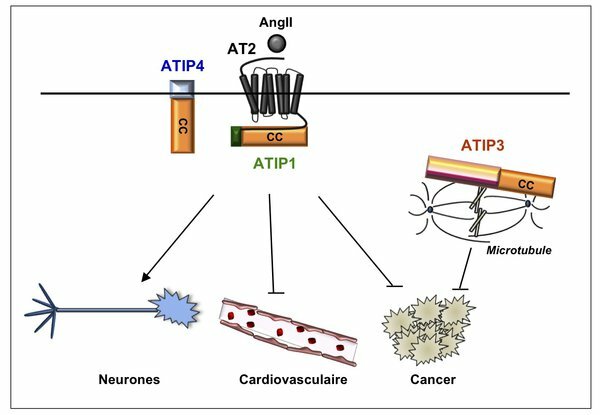 The peptide Angiotensin II (AngII), a major regulator of cardiovascular homeostasis, is also involved in brain function and tissue remodeling as well as in several aspects of cancer. AngII regulates cell proliferation, angiogenesis, migration and inflammation through binding to two subtypes of receptors, AT1 and AT2. Over the past decades, interests of our team have focused on the study of AT2 receptor signaling pathways. We have been the first to identify a novel family of AT2 receptor-interacting proteins (ATIPs). Three ATIP members (ATIP1, ATIP3 and ATIP4) are encoded by alternative splicing of a unique gene (MTUS1) located at 8p22, a chromosomal position frequently deleted in epithelial cancer. Over the past few years, our research projects have mainly focused on the roles of AngII and ATIP proteins in breast cancer. Major achievements include the demonstration that AngII facilitates breast cancer metastasis and the discovery of ATIP3 as a new microtubule-associated protein with anti-proliferative and anti-metastatic effects in breast tumors. These studies pave the way to the development of novel personalized therapies against breast cancer of poor prognosis.